Everyone has their weakpoint, the bits of their body they don’t like, the features that mother nature has cruelly cursed upon you. Yes my bum is bigger than I’d like and I have the hands of somebody 20 years older, but these aren’t the things that bother me. The one thing where I feel nature has played a cruel trick on me is my ankles. They’re not sleek smooth slender ankles like everybody else’s, they’re puffy and lumpy and rather unsightly. I’d even go so far to say…. .(it brings on a cold sweat even saying it)…….I believe I have a slight case of ‘cankles’! So when I heard Méthode Jeanne Piaubert had bought out a product specifically aimed at calves and ankles, my holy grail had arrived. It’s already been recommended in Easy Living, Glamour, OK, Stylist and Tatler Magazines, so of course I leapt at the opportunity to trial it myself. “SlimSculpt is the combination of four potent slimming actions, which effectively attacks the microcirculatory cellulite found on both the ankles and calves. The slimming and firming functions include three high performance anti-cellulite actions targeting microcirculatory, which it focuses on, as well as fibrous and fatty cellulites. A firming action completes the anti-cellulite treatment, followed by a refreshing effect which enhances the draining action and leaves legs feeling light. “Methode Jeanne Piaubert’s SlimSculpt Slimming Gel For Ankles And Calves” – to give it it’s full name – comes in a roll-on, so it’s really easy to apply. In terms of the product – the lotion smells pleasantly fruity, is non-sticky, dries quickly and leaves a refreshing tingly sensation. A good tip is to put the bottle in the fridge for an added icy tingle. I got rather carried away in the first few days applying at least 5 times a day – in the miraculous hope my legs would turn into Elle McPherson’s, but now I’m using morning and night as suggested. I’ve been using the product for a week now, and in terms of the results I’m not Elle yet, but I do see a difference. The silhouette seems a little sleeker, my ankles don’t feel as puffy, and my skin feels lovely and smooth. So I’m happy with the results (which in the case of my ankles – takes a lot!). This isn’t a miracle overnight cure to lose inches from your ankles, but if you suffer from fluid retention and puffy ankles, then this product is definitely for you. 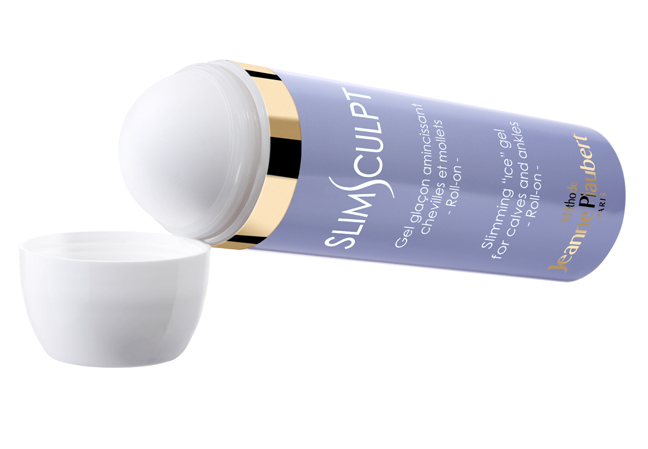 Plus SlimSculpt is a great travel companion – to help reduce that temporary swelling experienced on flights. This entry was posted on Wednesday, July 21st, 2010 at 11:05 am and is filed under Skincare, Tried & Tested. You can follow any responses to this entry through the RSS 2.0 feed. You can skip to the end and leave a response. Pinging is currently not allowed. Awesome site, I didnt have the chance to notice http://www.escentual.com before in my surfing! Keep up the great work!